How to enable Adobe Flash Player on your web browser? 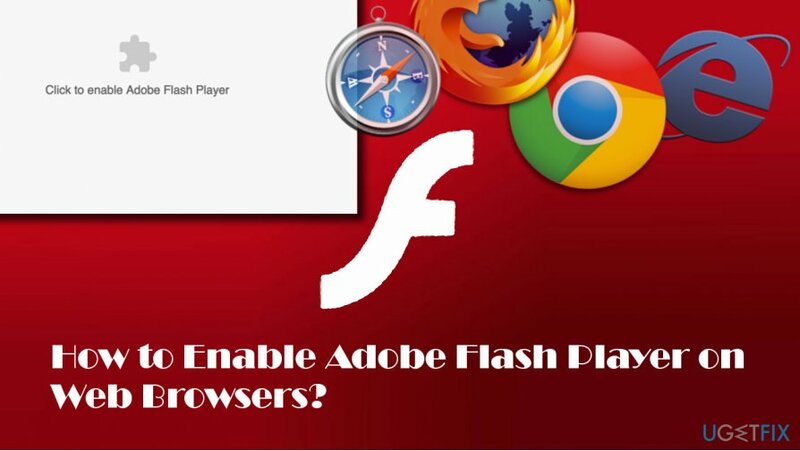 Home »	Optimize » How to enable Adobe Flash Player on your web browser? Issue: How to enable Adobe Flash Player on your web browser? When I try to load a video on Chrome, each time I get a notification that Flash Player is disabled. None of the videos are loaded. What can I do to solve this issue? Adobe Flash Player (also known as Shockwave Flash) is a free software utility, which is required for viewing content created on the Adobe Flash Platform. It can be used as an installed app both on Windows and Mac OS, as well as a plug-in on web browsers or mobile devices. Flash Player allows viewing multimedia, executing Internet apps or streaming video and audio. It supports 3D graphics, ActionScrip, vector and raster graphics, object-oriented code, and so on. It has millions of users worldwide and is not going to lose popularity as it’s a core app/plug-in for games, animations, and graphical user interfaces (GUIs). Unfortunately, Flash Player is considered to be a security risk. Although many websites do not use Adobe Flash Player, there are still loads of pages that will not open videos, audio and any content without Flash Player enabled. The problem is that Flash Player causes the browser to load an external file, known as .dll, which is often exploited by hackers and used as a medium to access the target system and install virus on it. Therefore, if you are using Adobe Flash Player on your web browser, make sure to update it regularly. IMPORTANT: DO NOT install Adobe Flash Player updates on doubtful web domains or by clicking on pop-up ads while browsing because you may install a virus/malware instead. Launch Chrome and type chrome://settings/content in the address bar. Find Flash Player on the list and check its status. Select Allow sites to run Flash and click Done. If you want to enable Flash Player on particular sites only, click Manage exceptions. Enter the addresses of preferred websites and click Allow. Once you add all needed sites, click Done and close Content settings. Launch Firefox and click on the three bar icon located at the top-right corner. Select Add-ons and click on Plugins on the left pane. Now find the Shockwave Flash and select Always Activate on the right. In case you would decide to deactivate it, instead of Always Activate, select Never Activate. Launch Edge and click the three-dot icon at the top-right corner of the screen. Select Settings and scroll down until you see View advanced settings. Find the Use Adobe Flash Player option and make sure that it’s on. Restart Edge to execute the changes.